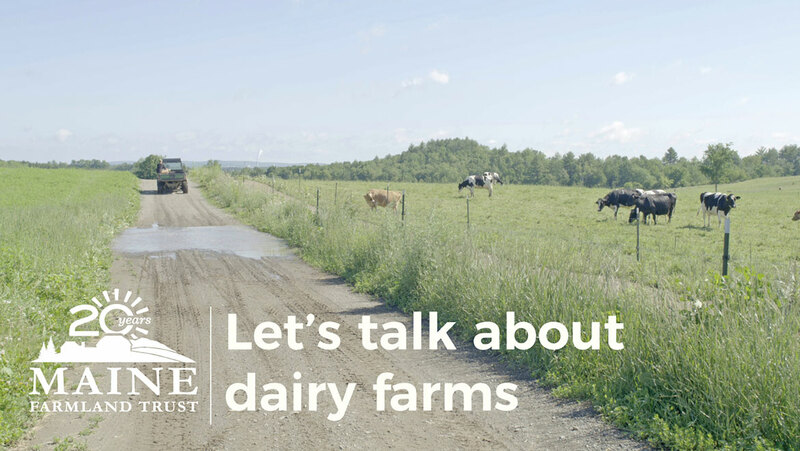 Join us to learn more about the key role dairy farms play in Maine’s agricultural landscape. See MFT’s new short video about the Dostie Farm, a multi-generational dairy farm in Skowhegan, and hear from a panel of your local dairy farmers that include: Egide Dostie II, Dostie Farm (Fairfield and Skowhegan; Brad Santy, Santy Dairy (Skowhegan); and Jim Hilton, Hilton Farms (Norridgewock). We’ll have light snacks and beer will be available for purchase for those 21+. Free and open to all ages! 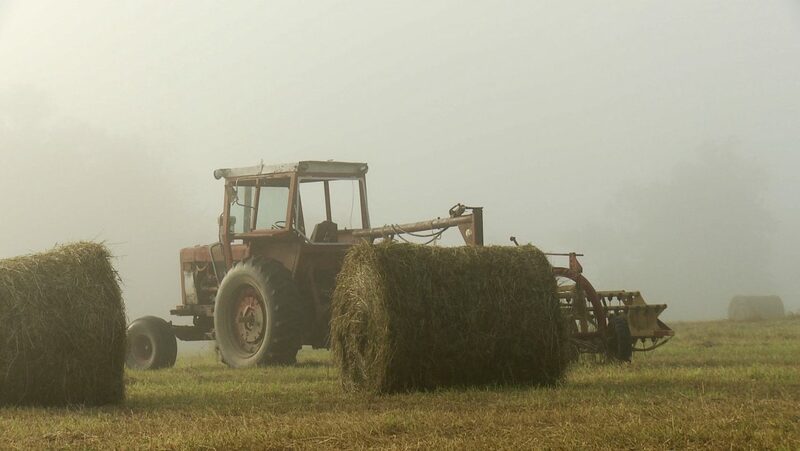 Join us at Railroad Square Cinema in Waterville on Wednesday, May 24th at 7:15 pm for Forgotten Farms, a new film about the important role dairy farms play in New England’s farming landscape. Dairy farmers remain the backbone of the region’s agriculture but fight for survival in an age of artisan cheese and kale. New England has lost over 10,000 dairy farms in the past 50 years; about 2,000 farms remain. Through conversations with farmers and policy experts, Forgotten Farms reconsiders the role of these vital but forgotten farmers, who will be essential players in an expanded agricultural economy. Amanda Beal of MFT, Dave Colson of MOFGA, along with the film makers and Maine dairy farmers, will discuss how the themes of the film are present in Maine’s dairy industry today and where we can go from here. Join us at Johnson Hall, Gardiner on Tuesday, May 23rd at 6:30 pm for Forgotten Farms, a new film about the important role dairy farms play in New England’s farming landscape. Join us at Space Gallery, Portland on Monday, May 22nd at 7:00 pm, (doors at 6:30) for Forgotten Farms, a new film about the important role dairy farms play in New England’s farming landscape. Presented by Maine Farmland Trust, MOFGA, and the Portland Food Co-op. 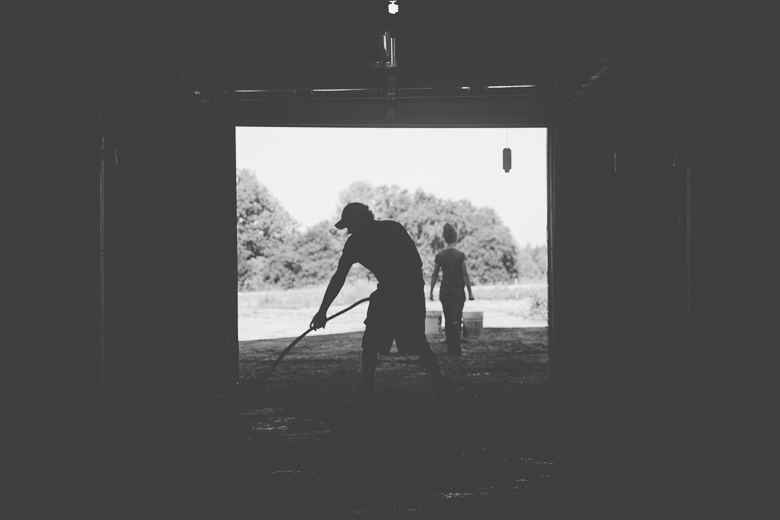 Another in our series about dairy farmers in Maine. 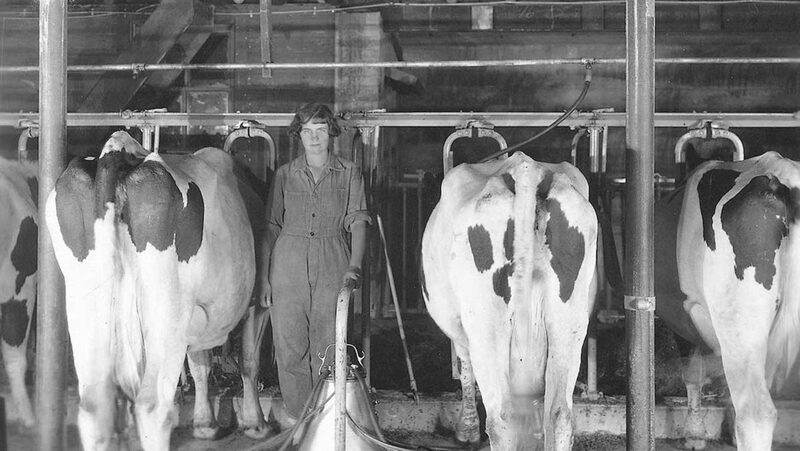 In many ways, dairy farms are the cornerstone of Maine’s farming community. 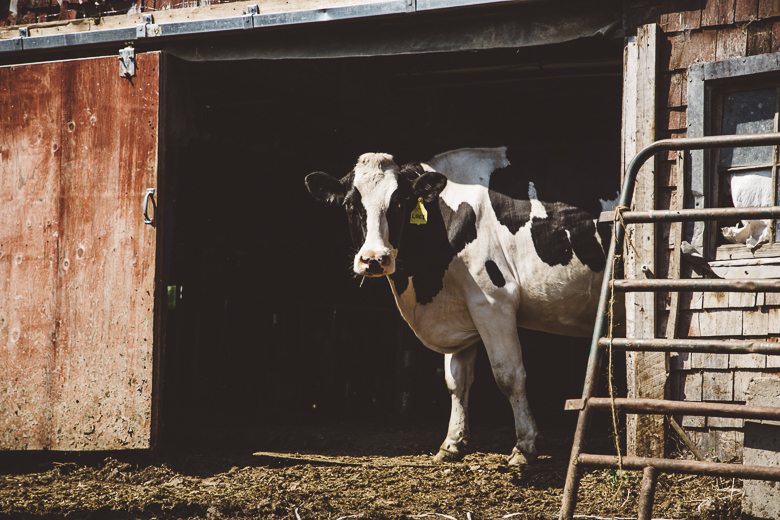 Dairy farmers steward large tracts of farmland for feed and forage, while supporting the feed stores, equipment retailers, and large animal vets that all Maine farms rely upon. Of the 400,000 acres of farmland that will be in transition over the course of the next decade, we anticipate that a large percentage of that land is currently in dairy farming. What will happen to that land, and the infrastructure and communities it supports? While farming in Maine is growing in many ways, Maine’s dairy industry has not seen the same kind of growth. Young dairy farmers are few and far between, often deterred by low milk prices and high start-up costs. Those who have bucked the trend and have decided to become either first-generation dairy farmers or to continue their family’s farm, have an important role to play in ensuring that dairy farms remain the foundation of Maine’s farming landscape. “Make hay while the sun shines” is something everyone says, but it’s a literal reality for dairy farmers. 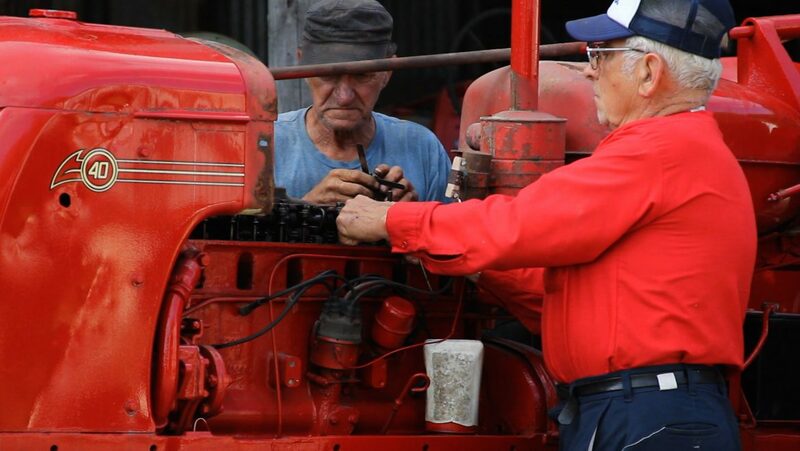 The first time I visited Walter and Austin Fletcher of Fletcher Farm in Pittsfield, Austin was cutting grass in the fields until dark, racing against the disappearing autumn daylight. Because it’s been such a dry summer, dairy farmers who rely on productive pastures that have been struggling to make a second or third cut before fall sets in, and the hustle for hay (and very few rainy rest days) means that it’s rare to catch father and son Walter and Austin in the same place at the same time. While Austin cut hay, Walter gave me a tour of the farm. The barn is outfitted with the Cabot logo, easily recognizable with the signature red and black checkered background. While walking around the farm and watching the evening milking, I was struck by how orderly and calm the farm is. All the cows were resting or munching contently in their quiet spaces, each one set up specifically for each group of cows, depending on age, health, and milking/fertility stage of life. The Fletchers take good care of their herd, from the calves up through the older cows, the latter of which are housed close to the barn for comfort and accessibility. Everything on the farm is done without fanfare, but with a tremendous amount of respect and care for the animals that produce the farm’s lifeblood: milk. Walter and his wife Edna bought 500 acres in Pittsfield in 1980 and started Fletcher Farm. Walter grew up on a dairy farm in Massachusetts and he can’t imagine a different path. “I really think that [farming] chose me,” said Walter. “At first it was a dream that we made real. Than a challenge to be successful not just as a business because farming is more than business it’s a way of life.” He and Edna raised three children on the farm. Austin, the youngest son, left for school and worked elsewhere for awhile but has since come back to join the business. Right now, the father and son team work together as partners in the LLC, from before sun up (morning milking starts at 3:30am) to sundown; the plan is for Austin to gradually take over the farm as Walter slowly transitions away from full-time farming. Dairy farming is a tough business. Luckily, Austin isn’t starting from scratch; he’s building on the strong foundation laid by his dad. 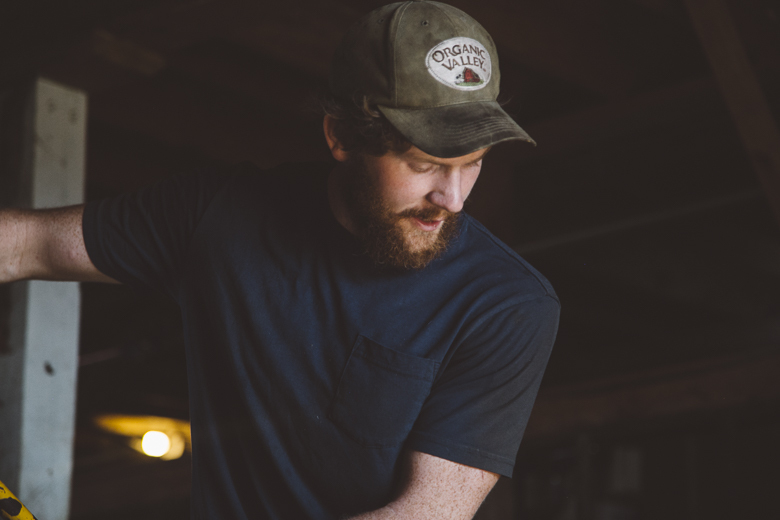 When he’s not engaged in farm work, Walter is involved in making sure that farming has a future throughout Maine, and is an active board member of Maine Farmland Trust, Agri-Mark and Cabot Creamery Cooperative. Though sitting on various boards means adding a lot of travel and meeting time onto his already full farming schedule, it’s important to him to be involved and work with the wider farming community. As Treasurer for Agri-Mark, Walter represents the concerns and interest of over 1,000 dairy farms and farming families. It’s a responsibility he takes very seriously, evident in his measured, respectful tone when he speaks about everything from the way Agri-Mark works to the way they organize their cows on the farm. There are challenges ahead for Maine’s dairy industry as farmers retire and land changes hands. Dairy farms like Fletcher Farm that are transferring to the next generation and staying in the family, are increasingly in the minority. 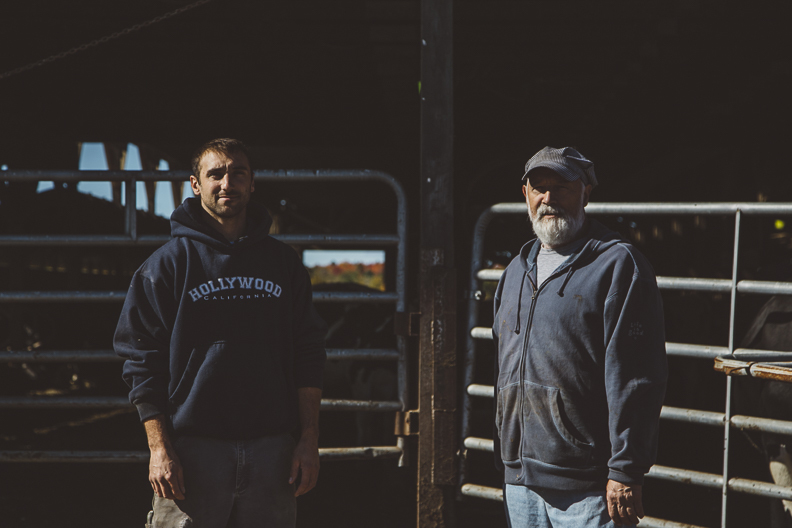 But despite an uncertain future, Walter and Austin are hopeful, and doing all that they can to ensure that dairy remains a key part of Maine’s farming landscape. While farming in Maine is growing, Maine’s dairy industry has not seen the same growth. The younger generation who are choosing to be dairy farmers are few and far between, often deterred by low milk prices and high start-up costs. Those who have bucked the trend and have decided to become either first-generation dairy farmers or to continue their family’s farm, have an important role to play in ensuring that dairy farms remain the foundation of Maine’s farming landscape. 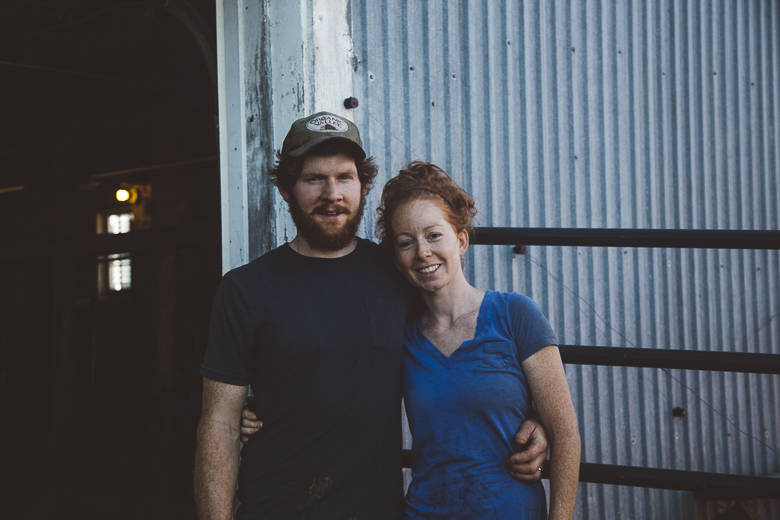 Conor and Alexis MacDonald own Bo Lait Farm, an organic dairy farm in Washington. Originally from New Hampshire and Maryland, respectively, the couple met four years ago in North Carolina where Conor was stationed in the Special Forces. Alexis happened to be visiting for a wedding, and the two hit it off. At the time, they had no idea they would one day start a dairy farm together, but now they can’t imagine it any other way. The decision to move to Maine was also a natural choice as well. Here they found “access to affordable land, a growing number of young farmers to network and connect with, vast beauty…” said Conor. 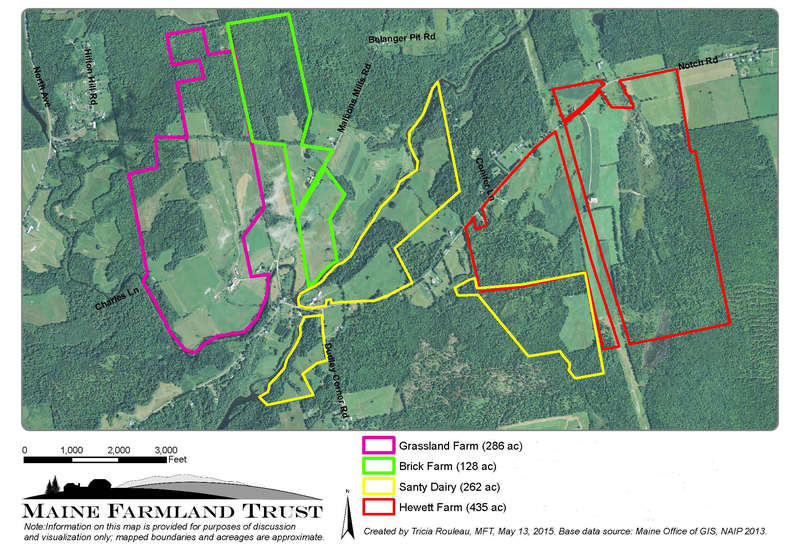 They worked with MFT when buying their farm to place an easement on the property, which made the farm more affordable. They are thrilled to have put down roots at Bo’Lait, which translates to “Cow Milk” and blends their respective ancestries (Bo’ is “cow” in Scottish Gaelic and “lait” is “milk” in French) to create a farm name that is both literal and unique. Right now they’re milking 38 of their 46 cows. “We’ve grown quite a bit over the last year and we think we’ll stay put at this herd size for a while. It feels manageable without being too crazy.” Their milk pool manager at Organic Valley has been a great resource for them as they’ve grown, and a great advocate as well. While farming in Maine is growing, the dairy industry is in decline. 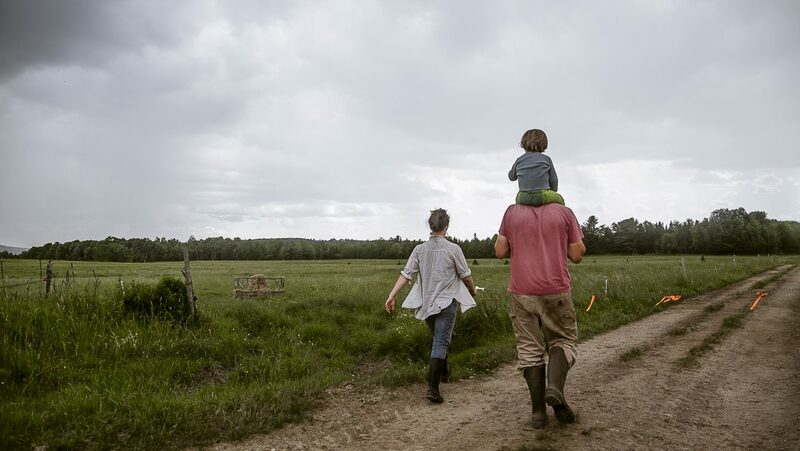 Caitlin Frame, Andy Smith and their son Linus are among the few young dairy farming families that are working against that trend, employing new strategies to make small-scale dairy farming viable. The cost of starting a dairy operation, which requires more land and infrastructure than the average vegetable farm, is a huge obstacle for young farmers looking to get into the dairy business. 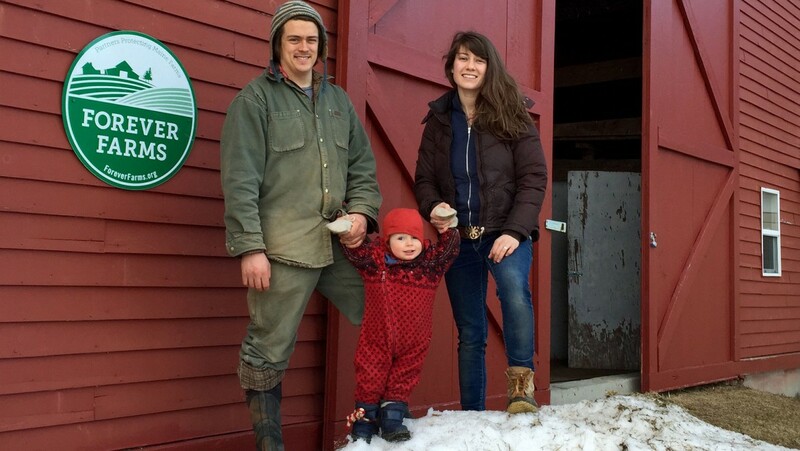 Caitlin and Andy spent several years working on farms and establishing a successful yogurt and bottled milk business before finding the perfect farm — through Maine FarmLink– to grow their farm business. The 280-acre property included much of the infrastructure they needed, and ample pasture, but was more expensive than they could afford. MFT purchased an easement on the property. This made the land more affordable and reduced the amount of money the couple needed to borrow for their mortgage. Help MFT close out our Securing a Future for Farming Campaign. Your gift to MFT means that more farmers will be able to access farmland and support services, more local food will get into the hands of Mainers who need it most, and more farmland will be protected for the future as well as available to support the growing local food economy today. Help grow the future of farming. Donate to MFT today!